Creative bath products are in various sizes and shapes. Whether you're making homemade products to sell or giving as gifts, creative ones are memorable. Homemade gifts and creative packaging say "thanks" for adding that extra special touch. Special gifts don't have to be expensive. Inexpensive gifts can be special and unique! Package homemade products to make them special! Special occasions, hobbies, holidays, pets, kids or sports are themes to base your creativity. Products can be placed in various containers including: boxes, tins, bags, vases, trays, baskets, buckets, tubs, etc… Containers make a statement! For instance, a simple box with the world globe may be perfect for a traveler. A colander may be perfect for a cook or chef. A bag with hearts says "I love you" and is perfect for that special someone. A plastic pumpkin bucket could offer colorful Fall soaps for pumpkin lovers. Make container sizes from sampler to huge! Add theme related items to containers. For instance for the world traveler, add a map, flashlight, compass or other item. For the cook, add oven mitts, towels, apron or other items. Add homemade recipes. For that special someone, add fragrant flower petals. For pumpkin lovers add special "treats" or homemade recipes. There are endless creative packaging possibilities using themes! Just the smallest extra touch can make the difference in displaying a product. Creative gifts should stand out from the rest of the pack! Go wild with your imagination and create something special! These homemade soaps are first wrapped with soft Alpaca wool, then with hand painted Merino sheep wool. The wool shrinks along with the soap. They're a homemade soap and soft scrubby all in one! This homemade goat milk soap is totally natural, unbleached and un-dyed. These colorful Fall soaps were entered in an ugly soap contest. The soap located at the left front is called Voodoo Soap. Sydne made this soap ugly deliberately. It has swirls of colors: black, brown, orange and purple. Sydne won the Ugly Soap Contest. Congratulations! Ask customer questions. Take notes. Send a FREE quote to those interested in ordering. -- What homemade products do they want in the container? Homemade shampoo, soap, lotion, lip balm, bath salts, etc… Gift certificates? Homemade recipes? -- What type of container do they want? Is there a theme? Some people may already have a special container and items in mind to be used. Others may just try to describe the container and special add on items. -- Would they like a commemorative card? Some may want to write their own message or have you do it for them. What should the card say? Deliver quality. Your creations should look professional and contain the highest quality homemade products. People want to know who you are and how to reach you. Print your company name, phone number and e-mail on product labels. Insert your company card in container. When displaying products, make prices plainly visible. 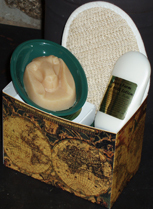 Your homemade products and packaging will display your creative professionalism. 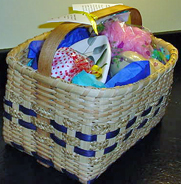 PRE-PACKAGED ITEMS: Offer homemade beauty products that are discounted, pre-packaged, items. Glittery gold or silver boxes, with clear tops, are beautiful for the holidays or any special occasions. Pre-packaged items are perfect for sales, holidays or merchandise you plan to discontinue. Items are grouped together with prices determined. Free quotes don't apply. Find more soap packaging tips and creative ideas! Don't forget the kids! If you have kids they may want make their own creative bath products. Set them around on display, use them in the tub or give as homemade gifts. Kids of various ages have fun making soap! They'll be proud of their artistic soap creation! HAVE YOU LOOKED AT AMAZON, YET?